Q: That's not an X-Men or Spider-Man villain! Who the heck is that? A: Why, it's Gypsy Moth, one of the earliest rascally opponents of the original Spider-Woman, Jessica Drew! Q: She looks lame. What kind of powers does she have? A: Unlike your typical X-Men villain, she doesn't shoot non descript energy or have a healing factor. Instead, she uses various telekinetic powers to manipulate fine materials like fabrics and organic tissues. She could choke you with your own clothing or kill you by collapsing your blood vessels. Q: Hey, that's pretty cool? So why the @#$% did you draw her? A: I picked up my 'Essential Marvel Universe Handbook vol.1' and put my finger between two random pages. 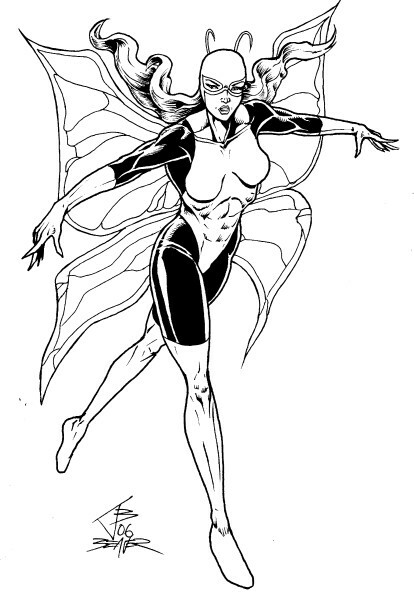 One page had a guy in a suit and the other had an attractive woman in a skintight costume and freaky moth wings. The choice was clear. Q: Thanks! Now I know! A: And... the power is yours! Wait, I got that wrong... it's... eh, forget it.